Albany Evening News: 200 to 500 Die As Dam Breaks, 3-13-1928. Nearly All Inhabitants Believed Buried Under Sand; Property Damage Called Enormous. Menace Seen to Los Angeles Water Supply, Railroad Bridges Washed Away, Citrus Groves Flooded. 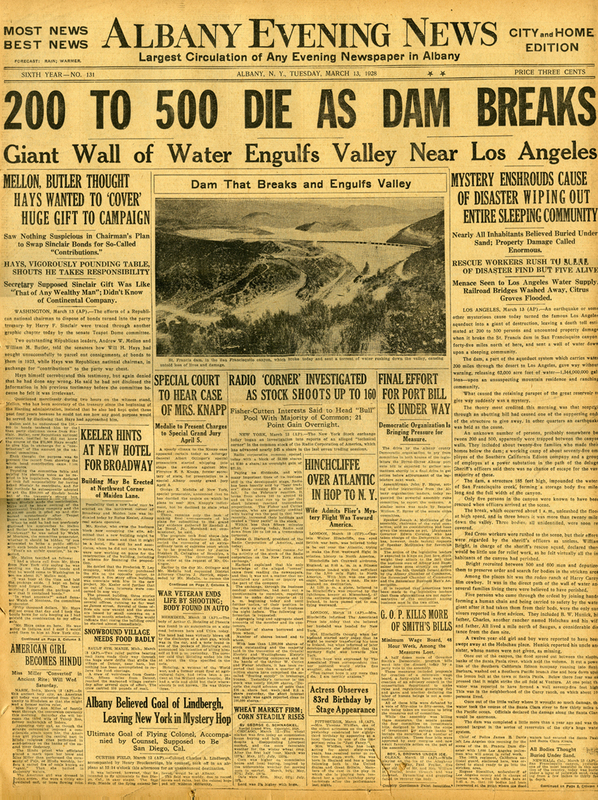 As can be seen in this Albany, New York newspaper from March 13, 1928, the St. Francis Dam disaster was big news and made huge banner headlines all over the country when first reported in the press. Today this second largest disaster in California history is mostly forgotten in the rest of the country but well remembered in the Santa Clarita Valley.